Naming and Blessing | Take Home a Souvenir! The name ‘Daenerys’ sound familiar? Well, according to the latest data from the Office for National Statistics, there were nine babies named after the popular Game of Thrones character in 2014. Still, ‘Oliver’ has once again topped the boy’s chart, whilst ‘Amelia’ has taken the no. one spot for girls (via Guardian). Trends include names ending in an ‘a’, and more experimental girls’ names. In the current top 100, ‘Harper’ is the girl’s name that has gained most popularity over the decade, shooting up 3,636 places to No 89. Perhaps something to do with the Beckhams? Not for the first time, parents are also registering the abbreviated form of a name, for example, Teddy, Freddie, and Joey. Naming and Blessing by Reverend Andrew Tawn is a collection of personalised name prayers for more than 500 baby names, perfect for christening readings or for parents wanting to pray for their child at any stage in their life. Below are the top two names in each category, taken from Andrew Tawn’s Naming and Blessing: A Book of Name Prayers. Amelia derives from the German for ‘labour’. 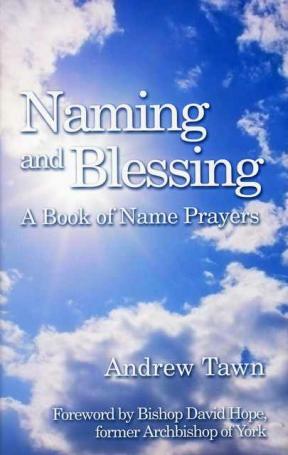 Naming and Blessing: A Book of Name Prayers by Reverend Andrew Tawn (ISBN: 9780285638921, £15) available to buy here. Ahead of the royal christening today of Prince George of Cambridge, we are sharing a personalised blessing prayer, taken from Reverend Andrew Tawn’s book of name prayers, Naming and Blessing. This personalised name prayer, like all of the others in the book for more than 500 names, can be used to pray for a child throughout their life, and makes the perfect reading to personalise a christening. Excellent, true, pure and gracious. eXchange his sorrows for joys. Remain with him and bless him for ever. Surrounding him to shield him. If you are celebrating the royal christening today, perhaps you will take a moment to share this personalised name prayer, a blessing for the young prince. For more than 500 other personalised name prayers, Naming and Blessing is available in hardcover with illustrations by Pat Schaverien. It would be the perfect gift for prospective or new parents, to celebrate the birth of a new baby. Souvenir Press would like to join the many thousands of people worldwide who have been offering their congratulations to the Duke and Duchess of Cambridge following the birth of their first child. Prince George Alexander Louis of Cambridge, born on Monday, will be the seventh king to bear that name. Naming and Blessing by Andrew Tawn is a unique baby name book, containing personalised prayers for over 500 names, which can be used as an introduction to the Christian faith and personalise baptisms, confirmations and weddings, as a child moves through the personal landmarks in their life. The below prayer for HRH Prince George of Cambridge is taken from Naming and Blessing by Andrew Tawn, published by Souvenir Press. Congratulations once more to the Duke and Duchess of Cambridge, as well as to all other parents celebrating a new addition to the family.